Set up a food processor with the grating attachment. Alternatively, you can use a box grater. Remove cauliflower florets from the stalk and cut into chunks. Process or grate cauliflower until small rice-sized pieces. Heat up the sesame oil in a wok over medium-high heat. Add the garlic and stir fry until fragrant. Add the processed cauliflower and cook for 2 mins or until almost cooked. Add in the carrots and shelled peas and cook until cooked through. 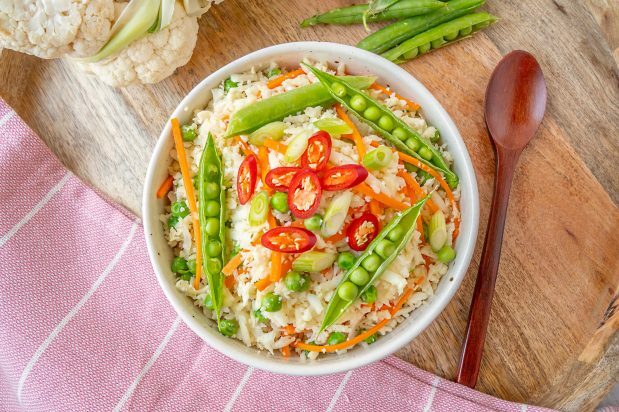 Scoop the cauliflower rice into a bowl and serve with sliced spring onion and chilli.